As a preface to the papers in this special issue on the role of procrastination in maladjustment, we provide an overview of the topics covered. To our knowledge, this is the first special issue that focuses specifically on the role of this form of self-regulatory failure in understanding maladjustment. We begin with a discussion of the complex array of motivational, affective, cognitive, and behavioural factors that operate in chronic procrastination. These complexities are illustrated with case studies that highlight the role of negative self-views and associated deficits in self-regulation. Themes explored in the papers include the role of cognitive factors in dysfunctional beliefs and automatic thoughts in procrastination, as well as the role of procrastination and deficits in self-regulation related to stress, psychological distress, and physical illness. Another key theme addressed is the usefulness of REBT and cognitive techniques such as mindfulness training in reducing the tendency to procrastinate. Dryden, W. (2012). Dealing with procrastination: The REBT approach and a demonstration session. Journal of Rational-Emotive and Cognitive-Behavior Therapy. doi: 10.1007/s10942-012-0152-x. Flett, G. L., Stainton, M., Hewitt, P. L., Sherry, S. B., & Lay, C. (2012). Procrastination automatic thoughts as a personality construct: An analysis of the Procrastinatory Cognitions Inventory. 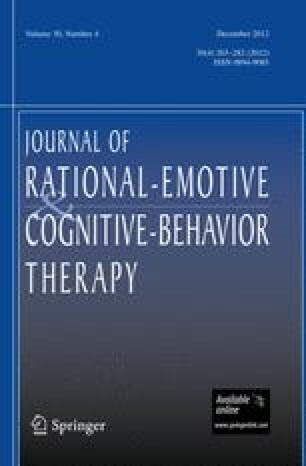 Journal of Rational-Emotive and Cognitive-Behavior Therapy. doi: 10.1007/s10942-012-0150-z. McCown, B., Blake, I. K., & Keiser, R. (2012). Content analyses of the beliefs of academic procrastinators. Journal of Rational-Emotive and Cognitive-Behavior Therapy. doi: 10.1007/s10942-012-0148-6. Sirois, F. M., & Tosti, N. (2012). Lost in the moment? An investigation of procrastination, mindfulness, and well-being. Journal of Rational-Emotive and Cognitive-Behavior Therapy. doi: 10.1007/s10942-012-0151-y.